Great stay-House was very well taken care of, everyone who came with us had a great time and had nothing but nice things to say about the view and everything that it entailed. We will definitely be coming back! 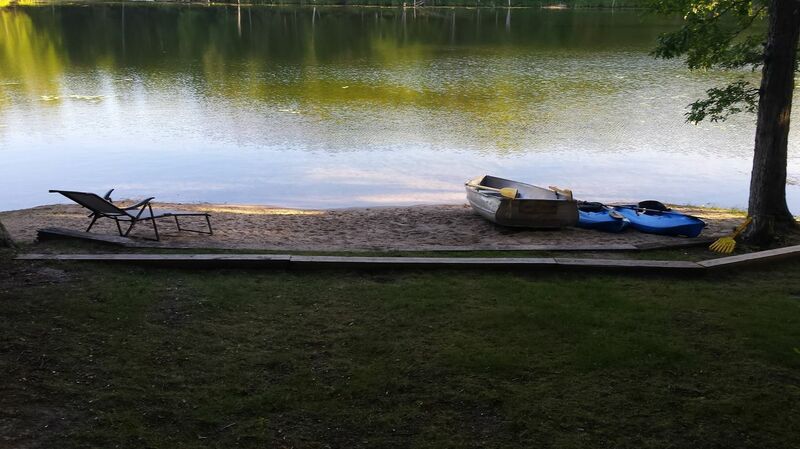 Nick, we are thrilled that you and your guests had such fun at Abbott Lake House. Having the beauty of Huron National Forest surrounding you is really something special. We look forward to seeing you again next year! Carla, you made our day! We love helping our guests have the best vacations ever, so we are really happy that Abbott Lake House was the perfect spot for you. We'll look forward to seeing you at one of our properties next year! Rhonda, FVR is happy to help make your dreams come true! Abbott Lake House has the best views of the lake and the fire pit is great for smores! We'll look for you again next year. Family week at Abbott-We thoroughly enjoyed our week at the Abbott House. This spacious home provided plenty of room for 5 adults and 3 young children to sleep comfortably. The kitchen was well equipped. The sandy beach was perfect for our 3 grandchildren under the age of 5 to enjoy as well as the shallow waterfront. The kayaks are a real plus as well as the fire pit. Also, the screened in porch was awesome. We enjoyed a great game night as well as several meals there. Freshwater Vacations does a great job of addressing anything that came up along the way. Thank you Cara and staff. Wendy, it makes us happy to hear that Abbott Lake House worked out so well for your family. Making summer vacation memories with grandkids is so special. We appreciate your comments about the staff of FVR. It is our mission to make each of our guest's stays as enjoyable and worry free as possible. We hope to see you again. Beautiful and relaxing lake view!-Spent three days at this lovely location, just fishing, kayaking and hanging out at the great bonfire pit. 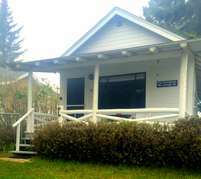 Lake is quiet and lovely and the cottage’s elevated sun porch offers a breathtaking view of the property and water. No dock, but didn’t miss it with the sandy beach area. HI Angela, isn't it great when you find the perfect vacation spot? Abbott Lake House offers so much to its guests. You certainly had a good weather week for swimming - nothing better that cool water on a hot day. We hope to see you back again. So happy to hear that you enjoyed your stay. We always appreciate when clients recommend us to their friends! Check out all of our 72 properties. We give returning guests a 10% discount when they book directly through us. We look forward to working with you in the future! Hi Maria! Thank you for taking the time to write a review of your stay at Abbott Lake House. We appreciate all of your positive comments. We are thrilled you got to enjoy Christmas with your family. We agree it's a great place whether it's winter or summer! We'd love to have you back this summer! Great! !-We really enjoyed our stay. The view was awesome, The house was cozy and had everything we needed. Watching the Deer, wild turkey's, and raccoons eat the feed you provided was well worth the trip. We would definitely stay there again and will recommend to others. September 2017 Abbott House-The property was everything we could have hoped for, it was clean well maintained and had plenty for our party to do with access to the lake and water craft (kayaks and row boat). The lake was small but stocked with fish and I even caught a nice sized Large Mouth Bass which I cooked over the fire pit. The thorough and professional service from Freshwater Vacation Rentals was outstanding. Cara and her team made sure we knew exactly which properties offered what we were looking for and were exceptionally prompt and knowledgeable with responses to any question we had. Cannot recommend them strongly enough. Thanks FVR! We are happy you enjoyed your stay and am thrilled you enjoyed the fishing! Please consider renting one of our 54 other properties the next time you plan your Michigan adventure. We thank you for the compliments and appreciate your recommendation to others! Hope to see you soon! National Forest! !-We did not realize we would be in the National Forest until we entered Loon Lake Loop Road. What a nice surprise! 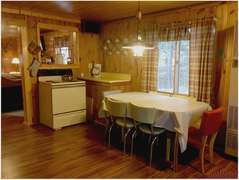 Enjoyed the home and amenities, hiking, nearby Faull Inn, and the lake out the back door! WE KNOW! SO COOL, RIGHT? We are happy you enjoyed your stay and are glad you were able to enjoy the different amenities and places nearby. Please consider booking with Freshwater in the future. We do have 54 other properties to choose from as well! ABSOLUTELY PERFECT!-The Abbott house was absolutely perfect!!! Cozy and beautiful!!! We will be back for sure!! Great location as well!! Thank you so much for sharing this cabin with us!! YEAH! We are thrilled that you enjoyed your stay! We agree the location is ideal and the house has so much to offer. Thank you for your compliments and comments. Be sure to let us know your 2018 dates, as bookings are already coming in! We are glad you enjoyed the house! We will make a notation in our description about the incline. Thank you for the suggestion. WHAT A BLAST!-The abbot lake house was a blast. It was a lot more than I had thought and the nicest place I have ever stayed at. None of us were ever bored there was always something for us to do. We will definitely be coming back. We are happy you enjoyed your stay. We agree, there is ALWAYS something to do at the Abbott Lake House. Please, give us a call so you can reserve a 2018 rental! Great place-The Abbott Lake house is all that was described and more. Rented it for a week in August, wanted to check out in spring. We have ATV's and trails are great and close. Two grandsons loved the beach, even in May 50 deg and sunny. Went out in the boat, water very clear can see alot. Everybody caught fish. Can not wait to return. Everything you need is there. Love the location very secluded. Even had dog beds and dog got along fine. Brought the kids bikes they loved the driveway. Plenty of places to relax. Looking forward to returning. We love boating too and Abbott Lake House is a great place for that and more! Good to know the fish are biting! We cater to our furry friends as well, why not bring them along! We have 54 other locations all waterfront, please check out our website for our newest vacation rentals across Michigan! The Abbott Lake house was a beautiful home. We enjoyed our stay and had a very relaxing stay. We really enjoyed all the nature, scenery, different types of birds, etc. Hope to get back this summer to enjoy the lake. My son had a great time fishing and was happy to catch different types of fish. We all hated to leave. Perfect-We liked the house a lot. We had troubles with the dishwasher, we called and had follow up during the day, at the end it was the breaker and get it to work again. WE like that we have good service and followup on the phone.We liked that it was very clean, it smelled very nice, very well equipped.Note: we did not find the extra set of keys on the kitchenAlso, one suggestion is to have few kitchen utensils for the oven, we want it to bake some food and could not find anything that would look like oven safe. Great Stay-We were very happy with the property and accommodations provided. We would definitely stay again.